My son’s big milestone. Bigger news than Bin Laden? Depends on your prespective. Today two totally different things happened that I would classify as milestones. The first is that my 8 year old finally rode his 2 wheeler bike, and the second is that Osama Bin Laden apparently got killed. What to talk about? Of course it would be my son. Who really gives a flying poop about Bin Laden? My little man had a really rough go of it the last couple of years around biking. 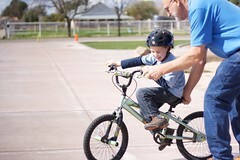 I took him out on his 6th birthday on a brand new bike to the local soccer fields, and I must have ran half the day to get him to the point of riding his two wheeler. But then, a winter went by, and then a very chaotic year when his mom and I separated. He didn’t get back on the bike for another year. He got on the bike and wiped out. It hurt his confidence, and he gave up. I felt bad for him. I think he wished that he could get into mountain biking so he could have that one on one time with his dad. Poor little guy.His dream was crushed. So today, after two years of not riding his bike, his little brother who is just about to turn 5 got his training wheels off to see if he would ride a two wheeler. Well, that got his attention! There was NO WAY that his little brother was going to ride a two wheeler before him. So, he grabbed the bike(that is far too small for him now) and within 15 minutes had got the hang of it again. He was so proud of himself. He threw his arms in the air like Rocky Balboa! He could finally tell all his friends that he could ride a bike. The look of relief on his face spoke volumes. He had finally conquered the monkey on his back. The fear in his mind that he would NEVER learn to ride a bike had passed.All he wanted to do the rest of the day was ride the bike. Over and over again. It was precious to watch. What could be worse than being that kid who couldn’t ride a bike, and whose dad was a fanatical mountain biker? Next PostNext After today’s Canadian election disaster, are you worried about the aging Baby Boomers?